It's flame-on at Park City's Firewood. Maybe this is something that shouldn't be said aloud, but each time I visit Park City's new restaurant Firewood, I think: "I sure hope they have fire insurance and a really good fire-suppression system." It's the creation of chef/owner John Murcko and his family, who were intimately involved in gutting the former Cicero's restaurant and bar space and building Firewood from the ground up. The gorgeous new Main Street addition features, not surprisingly, lots and lots of wood. Murcko's father designed the interior, and the father-son team even built the restaurant's wooden tables by hand. It's a warm, inviting space with a hot kitchen. The centerpiece of the restaurant's kitchen—which can be viewed by guests via dining room-long insulated windows—is an extraordinarily expensive Grillworks Infierno 154. The multi-station wood-burning grill allows Firewood's cooks to use different woods (cherry, apple, hickory, etc.) and various temperatures best-suited to the foods being prepared. The temperatures of the four grilling stations are controlled both by crankwheel-adjustable grill surfaces and via the temperamental art of adjusting the heat of burning woods. The first such grill was built by Grillworks for Tom Colicchio's Beachcraft restaurant in Miami; I'm told there are only five such Infierno grills in North America. The device is aptly named, since I discovered that it is indeed an inferno in the kitchen. The staff says simply, "You get used to it." If John Murcko's name ring a bell, it should. He helped restauranteur Bill White build and open Grappa in Park City, and worked in various White restaurant kitchens there. Eventually, he moved over to The Farm before doing a stint as executive chef at Sun Valley Resort. When thinking about opening his own restaurant, Murcko went back to his roots and his lifelong love of a most primitive cooking method: open wood flame. At Firewood, he gets his wish; almost everything is cooked with flame. Except for a sous vide device, I didn't see another cooking source in the kitchen. Even baking and braising are accomplished using wood-fired heat. So, you might be surprised when you dine at Firewood that most dishes aren't charred or crusty, as you might expect. The scent of burning meats does not pervade the kitchen or restaurant. The cooking, as you'd expect in a fine dining establishment like this one, is subtle. It's testament to the skillful kitchen staff that not a single item I tried—a couple dozen during multiple visits—was overcooked, much less burned. I half-expected a sextet of grilled oysters ($19), for example, to be tough and chewy; such has been my previous experience with the grilled bivalves. Nope. 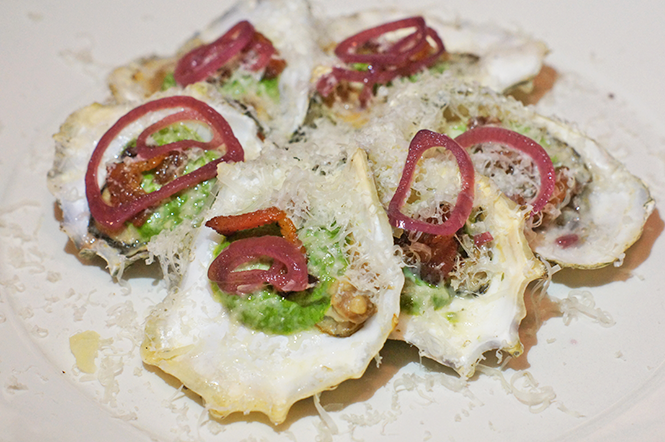 The oysters—topped with spinach pesto, wood-roasted bacon, beet-pickled shallot slices and finely shredded Parmigiano-Reggiano—were soft, silky and scrumptious. Likewise, a shareable starter of grilled pork belly ($16) with honey-wine apple vinegar and red pear/frisée salad was oh-so tender, juicy and flavorful. Murcko's twist on the traditional Caesar salad ($15) is extraordinary—one of my favorite dishes at Firewood. Romaine ribs are topped with a heavenly dressing, toasted pumpernickel crumbs in the place of croutons and shaved Parmigiano, served with two pieces of smoked hamachi. Look very close at the Caesar, and you'll find nearly invisible pieces of salted egg yolk, microplaned onto the lettuce leaves, which imparts more flavor and texture than if the yolks had merely been incorporated into the dressing, as is traditional. Other top-flight starters include oak wood-roasted acorn squash; fire-braised wild mushrooms (royal trumpets, wood beach and chanterelles); delicious ember-roasted cauliflower salad with shishito pepper vinaigrette; and hay-roasted housemade burrata with "massaged" kale, green apple and cider vinaigrette. Recently, I wrote about my policy not to review restaurants based on pre-opening events or "soft" opening. I also try not to review eateries before the paint on the walls is dry. Here's why: On our first visit to Firewood—just the second night they were open to the public—service was sketchy. It was friendly, but water glasses went unfilled and a large segment of the service staff seemed to be wandering around, unsupervised and without direction—sub-par for an upscale and expensive restaurant like Firewood. Less than a month later, it was a night-and-day difference. Service couldn't have been better, from bussers to our excellent waiter, Augustus Leon Harper, who was wooed back into service (he's a real estate broker) by Murcko to help shore up the staff. As I told Harper, if I had 10 servers like him, I'd have the confidence to open my own restaurant. The lightly browned, organic, airline-style chicken ($35) was plump and juicy, and reminded me of how flavorful the humble chicken can be. It was served on a plate of garlic-thyme-butter jus with puréed sweet potatoes, slightly charred Brussels sprouts and sprinkled with pomegranate seeds. A beautifully crusted Arctic char fillet ($36) rested on thick fire-roasted clam, cabbage and bacon sauce, adorned with gremolata and broccolini. The same gorgeous crust enhances the flavor of the knockout grilled diver sea scallops ($37), which come with a divine cauliflower-sunchoke-tarragon sauce. As with pretty much everything else, the desserts seem to punch above their weight class. Pastry chef Aimee Altizer is a wizard with wood-fired cooking. Her simple-but-stupendous wood-roasted apple with winter-spice mulled fruit, housemade almond gelato and Slide Ridge honeycomb ($12) was remarkable. Ditto her pot du crème made with Ecuadorian cacao Solstice Chocolate and an unforgettable chesnut-honey crème brûlée with Amano chocolate and preserved cherries. Without even detailing the inviting and unique Nickel Bar downstairs, or the excellent wine, beer and cocktail selection, I am happy to report that John Murcko is back, and that Firewood is crackling.